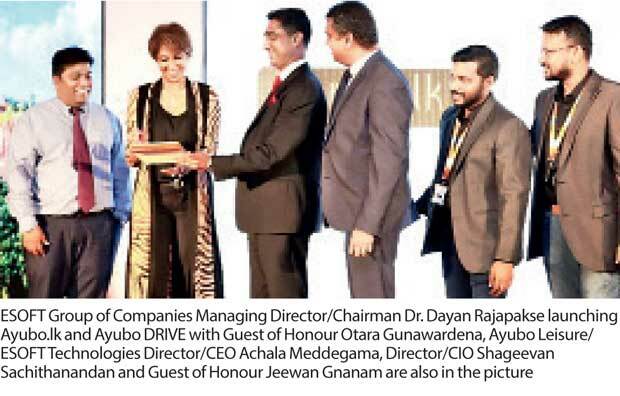 Ayubo Leisure, the company behind the world’s only all-in-one travel platform recently launched Ayubo.lk and Ayubo DRIVE at the Shangri-La Hotel Colombo. Ayubo Leisure operates www.ayubo.lk, the world’s only all-in-one travel platform which is accessible over the web providing users with the ability to create a customisable, easily bookable itinerary that includes accommodation, activities and transport options. The Ayubo platform was developed by ESOFT Technologies (ET), a technology company dedicated to creating innovative and robust systems for simple and complex business automation requirements. ET and Ayubo are members of the ESOFT Group. Ayubo, part of a word which forms the most auspicious sounds of the word Ayubowan, wishes you long life, wealth and prosperity. Ayubo.lk has a patent pending and is Sri Lanka’s first Online Travel Agent (OTA) to offer an all in one check-out for Hotels, Activities and Transport. Ayubo’s aspirations are global with good reason. complementing Ayubo Leisure’s industry changing global efforts says the group’s Managing Director Dr. Dayan Rajapakse. He reminisces how it was at an opportune time that he was approached by Achala Meddegama (Today the Ayubo’s CEO) with the idea of an all in one checkout for travel and tourism. Dr. Dayan had seen an opportunity, noting unsold room nights across the range of bedding options at so called off peak times. With over two million visitors arriving in the island last year, it is high time to offer smart digital services as well traditional concierge services to the exclusive, ever discerning traveller says Dr. Dayan Rajapakse. Ayubo.lk allows locals and foreigners to find and book their own travel itinerary. Ayubo Leisure Destination Management (inbound and outbound tours), which helps travellers find nearby attractions and activities at destinations. Then Ayubo DRIVE - Vehicle Rentals which helps travellers get to destinations safely in comfort. Finally, Ayubo Corporate - MICE travel partner which coordinates corporate getaways, meetings, training and workshops exhibitions and more. Booking a five-star hotel room at the beach, a whale watching ride and a diving experience, finding the right vehicle depending on with whom and how you plan to travel is a breeze on the site says Ayubo CIO Shageevan Sachithanandan. The home page offers a quick access list of top offers, hotels, activities and transport with a familiar search bar for each category. Advanced search filters also exist, so you can even search for all camping sites near National Parks or just at a location like Yala. At the checkout you can even see a route map laying routes to get from one destination to the next in your travel plan, and allows you to pay with popular payment options lie Visa, Master, Amex and others. Ayubo.lk was also recognised as the best product in the Travel and Tourism category at E-Swabhimani 2017 by the ICTA. Ayubo.lk was also the sole product from Sri Lanka to compete in this same category at the UN World Summit Awards of 2017 as well. For each hotel or service booking on Ayubo.lk, customers get a voucher. Hotels and service providers are informed instantly, and they can look up the guest information to prepare for their arrivals. Additionally, with Ayubo DRIVE, the company also offers the service of managing the travel desks of hotels. A complimenting mobile application with advanced augmented reality features is also being built to provider an even better experience for ayubo.lk and Ayubo DRIVE customers. With a committed team of global citizens and born leisure people, Ayubo Leisure is all about bringing delight to your leisure.